Author Information: Jeff Kochan, University of Konstanz, jwkochan@gmail.com. Kochan, Jeff. “Decolonising Science in Canada: A Work in Progress.” Social Epistemology Review and Reply Collective 7, no. 11 (2018): 42-47. 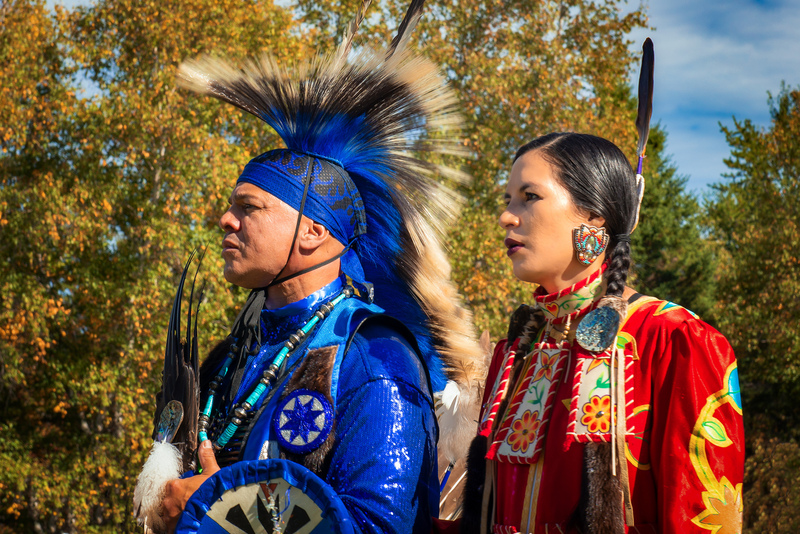 A Mi’kmaw man and woman in ceremonial clothing. Wills, Bernard (2018). ‘Weak Scientism: The Prosecution Rests.’ Social Epistemology Review & Reply Collective 7(10): 31-36. In a recent debate about scientism in the SERRC pages, Bernard Wills challenges the alleged ‘ideological innocence’ of scientism by introducing a poignant example from his own teaching experience on the Grenfell Campus of Memorial University, in Corner Brook, Newfoundland (Wills 2018: 33). Note that Newfoundland, among its many attractions, claims a UNESCO World Heritage site called L’Anse aux Meadows. Dating back about 1000 years, L’Anse aux Meadows is widely agreed to hold archaeological evidence for the earliest encounters between Europeans and North American Indigenous peoples. Southwest Newfoundland is a part of Mi’kma’ki, the traditional territory of the Mi’kmaq. This territory also includes Nova Scotia, Prince Edward Island, and parts of New Brunswick, Québec, and Maine. Among North America’s Indigenous peoples, the Mi’kmaq can readily claim to have experienced some of the earliest contact with European culture. Let us now turn to Wills’s example. A significant number of students on the Grenfell Campus are Mi’kmaq. These students have sensitised Wills to the fact that science has been used by the Canadian state as an instrument for colonial oppression. By cloaking colonialism in the claim that science is a neutral, universal standard by which to judge the validity of all knowledge claims, state scientism systematically undermines the epistemic authority of ancient Mi’kmaq rights and practices. Wills argues, ‘[t]he fact that Indigenous knowledge traditions are grounded in local knowledge, in traditional lore and in story means that on questions of importance to them Indigenous peoples cannot speak. It means they have to listen to others who “know better” because the propositions they utter have the form of science.’ Hence, Wills concludes that, in the Canadian context, the privileging of science over Indigenous knowledge ‘is viciously exploitative and intended to keep indigenous peoples in a place of dependency and inferiority’ (Wills 2018: 33-4). There is ample historical and ethnographic evidence available to support Wills’s claims. John Sandlos, for example, has shown how the Canadian state, from the late 19th century to around 1970, used wildlife science as a ‘coercive’ and ‘totalizing influence’ in order to assert administrative control over Indigenous lives and lands in Northern Canada (Sandlos 2007: 241, 242). Paul Nadasdy, in turn, has argued that more recent attempts by the Canadian state to establish wildlife co-management relationships with Indigenous groups are but ‘subtle extensions of empire, replacing local Aboriginal ways of talking, thinking and acting with those specifically sanctioned by the state’ (Nadasdy 2005: 228). The suspicions of Wills’s Mi’kmaw students are thus well justified by decades of Canadian state colonial practice. Yet Indigenous peoples in Canada have also pointed out that, while this may be most of the story, it is not the whole story. For example, Wills cites Deborah Simmons in support of his argument that the Canadian state uses science to silence Indigenous voices (Wills 2018: 33n4). Simmons certainly does condemn the colonial use of science in the article Wills cites, but she also writes: ‘I’ve seen moments when there is truly a hunger for new knowledge shared by indigenous people and scientists, and cross-cultural barriers are overcome to discuss research questions and interpret results from the two distinct processes of knowledge production’ (Simmons 2010). In the haystack of Canada’s ongoing colonial legacy, it can often be very difficult to detect such slivers of co-operation between scientists and Indigenous peoples. For example, after three decades of periodic field work among the James Bay Cree, Harvey Feit still found it difficult to accept Cree claims that they had once enjoyed a long-term, mutually beneficial relationship with the Canadian state in respect of wildlife management in their traditional hunting territories. But when Feit finally went into the archives, he discovered that it was true (Feit 2005: 269; see also the discussion in Kochan 2015: 9-10). In a workshop titled Research the Indigenous Way, part of the 2009 Northern Governance and Policy Research Conference, held in Yellowknife, Northwest Territories, participants affirmed that ‘Indigenous people have always been engaged in research processes as part of their ethical “responsibility to keep the land alive”’ (McGregor et al. 2010: 102). At the same time, participants also recognised Indigenous peoples’ ‘deep suspicion’ of research as a vehicle for colonial exploitation (McGregor et al. 2010: 118). Yet, within this conflicted existential space, workshop participants still insisted that there had been, in the last 40 years, many instances of successful collaborative research between Indigenous and non-Indigenous practitioners in the Canadian North. According to one participant, Alestine Andre, these collaborations, although now often overlooked, ‘empowered and instilled a sense of well-being, mental, physical, emotional, spiritual good health in their Elders, youth and community people’ (McGregor et al. 2010: 108). At the close of the workshop, participants recommended that research not be rejected, but instead indigenised, that is, put into the hands of Indigenous practitioners ‘who bear unique skills for working in the negotiated space that bridges into and from scientific and bureaucratic ways of knowing’ (McGregor et al. 2010: 119). Indigenised research should both assert and strengthen Indigenous rights and self-government. Furthermore, within this indigenised research context, ‘there is a role for supportive and knowledgeable non-Indigenous researchers, but […] these would be considered “resource people” whose imported research interests and methods are supplementary to the core questions and approach’ (McGregor et al. 2010: 119). Becoming a non-Indigenous ‘resource person’ in the context of decolonising science can be challenging work, and may offer little professional reward. As American archaeologist, George Nicholas, observes, it ‘requires more stamina and thicker skin than most of us, including myself, are generally comfortable with – and it can even be harmful, whether one is applying for permission to work on tribal lands or seeking academic tenure’ (Nicholas 2004: 32). Indigenous scholar Michael Marker, at the University of British Columbia, has likewise suggested that such research collaborations require patience: in short, ‘don’t rush!’ (cited by Wylie 2018). Carly Dokis and Benjamin Kelly, both of whom study Indigenous water-management practices in Northern Ontario, also emphasise the importance of listening, of ‘letting go of your own timetable and relinquishing control of your project’ (Dokis & Kelly 2014: 2). Together with community-based researchers, Dokis and Kelly are exploring new research methodologies, above all the use of ‘storycircles’ (https://faculty.nipissingu.ca/carlyd/research/). Such research methods are also being developed elsewhere in Canada. The 2009 Research the Indigenous Way workshop, mentioned above, was structured as a ‘sharing circle,’ a format that, according to the workshop facilitators, ‘reflect[ed] the research paradigm being talked about’ (McGregor et al. 2010: 101). Similarly, the 13th North American Caribou Workshop a year later, in Winnipeg, Manitoba, included an ‘Aboriginal talking circle,’ in which experiences and ideas about caribou research were shared over the course of one and a half days. The ‘relaxed pace’ of the talking circle ‘allowed for a gradual process of relationship-building among the broad spectrum of Aboriginal nations, while providing a scoping of key issues in caribou research and stewardship’ (Simmons et al. 2012: 18). One observation shared by many participants in the caribou talking circle was the absence of Indigenous youth in scientific discussions. According to the facilitators, an important lesson learned from the workshop was that youth need to be part of present and future caribou research in order for Indigenous knowledge to survive (Simmons et al. 2012: 19). This problem spans the country and all scientific fields. As Indigenous science specialist Leroy Little Bear notes, the Canadian Royal Commission on Aboriginal Peoples (1991-1996) ‘found consistent criticism among Aboriginal people in the lack of curricula in schools that were complimentary to Aboriginal peoples’ (Little Bear 2009: 17). This returns us to Wills’s Mi’kmaw students at the Grenfell Campus in Corner Brook. A crucial element in decolonising scientific research in Canada is the encouragement of Indigenous youth interest in scientific ways of knowing nature. Wills’s observation that Mi’kmaw students harbour a keen suspicion of science as an instrument of colonial oppression points up a major obstacle to this community process. Under present circumstances, Indigenous students are more likely to drop out of, rather than to tune into, the science curricula being taught at their schools and universities. Mi’kmaw educators and scholars are acutely aware of this problem, and they have worked assiduously to overcome it. In the 1990s, a grass-roots initiative between members of the Mi’kmaw Eskasoni First Nation and a handful of scientists at nearby Cape Breton University (CBU), in Nova Scotia, began to develop and promote a new ‘Integrative Science’ programme for CBU’s syllabus. Their goal was to reverse the almost complete absence of Indigenous students in CBU’s science-based courses by including Mi’kmaw and other Indigenous knowledges alongside mainstream science within the CBU curriculum (Bartlett et al. 2012: 333; see also Hatcher et al. 2009). In Fall Term 2001, Integrative Science (in Mi’kmaw, Toqwa’tu’kl Kjijitaqnn, or ‘bringing our knowledges together’) became an accredited university degree programme within CBU’s already established 4-year Bachelor of Science Community Studies (BScCS) degree (see: http://www.integrativescience.ca). In 2008, however, the suite of courses around which the programme had been built was disarticulated from both the BScSC and the Integrative Science concentration, and was instead offered within ‘access programming’ for Indigenous students expressing interest in a Bachelor of Arts degree. The content of the courses was also shifted to mainstream science (Bartlett et al. 2012: 333). Throughout its 7-year existence, the Integrative Science academic programme faced controversy within CBU; it was never assigned a formal home department or budget (Bartlett et al. 2012: 333). Nevertheless, the programme succeeded in meeting its original goal. Over those 7 years, 27 Mi’kmaw students with some programme affiliation graduated with a science or science-related degree, 13 of them with a BScSC concentration in Integrative Science. In 2012, most of these 13 graduates held key service positions within their home communities (e.g., school principal, research scientist or assistant, job coach, natural resource manager, nurse, teacher). These numbers compare favourably with the fewer than 5 Indigenous students who graduated with a science or science-related degree, unaffiliated with Integrative Science, both before and during the life of the programme (Bartlett et al. 2012: 334). All told, up to 2007, about 100 Mi’kmaw students had participated in first-year Integrative Science courses at CBU (Bartlett et al. 2012: 334). From its inception, Integrative Science operated under an axe, facing, among other things, chronic ‘inconsistencies and insufficiencies at the administrative, faculty, budgetary and recruitment levels’ (Bartlett 2012: 38). One could lament its demise as yet one more example of the colonialism that Wills has brought to our attention in respect of the Grenfell Campus in Corner Brook. Yet it is important to note that the culprit here was not science, as such, but a technocratic – perhaps scientistic – university bureaucracy. In any case, it seems inadequate to chalk up the travails of Integrative Science to an indiscriminate search for administrative ‘efficiencies’ when the overall nation-state context was and is, in my opinion, a discriminatory one. But this is not the note on which I would like to conclude. To repeat, up to 2007, about 100 Mi’kmaw students had participated in first-year Integrative Science courses. That is about 100 Mi’kmaw students who are, presumably, less likely to hold the firmly negative attitude towards science that Wills has witnessed among his own Mi’kmaw students in Newfoundland. As I wrote above, in the haystack of Canada’s ongoing colonial legacy, it can be very difficult to detect those rare slivers of co-operation between scientists and Indigenous peoples on which I have here tried to shine a light. If this light were allowed to go out, a sense of hopelessness could follow, and then an allegedly hard border between scientific and Indigenous knowledges may suddenly spring up and appear inevitable, if also, for some, lamentable. Bartlett, Cheryl (2012). ‘The Gift of Multiple Perspectives in Scholarship.’ University Affairs / Affaires universitaires 53(2): 38. Bartlett, Cheryl, Murdena Marshall, Albert Marshall and Marilyn Iwama (2015). ‘Integrative Science and Two-Eyed Seeing: Enriching the Discussion Framework for Healthy Communities.’ In Lars K. Hallstrom, Nicholas Guehlstorf and Margot Parkes (eds), Ecosystems, Society and Health: Pathways through Diversity, Convergence and Integration (Montréal: McGill-Queens University Press), pp. 280-326. Bartlett, Cheryl, Murdena Marshall and Albert Marshall (2012). ‘Two-Eyed Seeing and Other Lessons Learned within a Co-Learning Journey of Bringing Together Indigenous and Mainstream Knowledges and Ways of Knowing.’ Journal of Environmental Studies and Sciences 2: 331-340. Dokis, Carly and Benjamin Kelly (2014). ‘Learning to Listen: Reflections on Fieldwork in First Nation Communities in Canada.’ Canadian Association of Research Ethics Boards Pre and Post (Sept): 2-3. Feit, Harvey A. (2005). ‘Re-Cognizing Co-Management as Co-Governance: Visions and Histories of Conservation at James Bay.’ Anthropologica 47: 267-288. Hatcher, Annamarie, Cheryl Bartlett, Albert Marshall and Murdena Marshall (2009). ‘Two-Eyed Seeing in the Classroom Environment: Concepts, Approaches, and Challenges.’ Canadian Journal of Science, Mathematics and Technology Education 9(3): 141-153. McGregor, Deborah, Walter Bayha & Deborah Simmons (2010). ‘“Our Responsibility to Keep the Land Alive”: Voices of Northern Indigenous Researchers.’ Pimatisiwin: A Journal of Aboriginal and Indigenous Community Health 8(1): 101-123. Nadasdy, Paul (2005). ‘The Anti-Politics of TEK: The Institutionalization of Co-Management Discourse and Practice.’ Anthropologica 47: 215-232. Nicholas, George (2004). ‘What Do I Really Want from a Relationship with Native Americans?’ The SAA Archaeological Record (May): 29-33. Sandlos, John (2007). Hunters at the Margin: Native People and Wildlife Conservation in the Northwest Territories (Vancouver: UBC Press). Simmons, Deborah, Walter Bayha, Danny Beaulieu, Daniel Gladu & Micheline Manseau (2012). ‘Aboriginal Talking Circle: Aboriginal Perspectives on Caribou Conservation (13th North American Caribou Workshop).’ Rangifer, Special Issue #20: 17-19. Wylie, Alison (2018). ‘Witnessing and Translating: The Indigenous/Science Project.’ Keynote address at the workshop Philosophy, Archaeology and Community Perspectives: Finding New Ground, University of Konstanz, 22 October 2018.